Versatile, comprehensive surround support - With support for up to 7.1 channels, Stratus is right at home in any industry-standard surround workflow. Generate clean, articulate rooms for dialogue mixing, or capitalize on the multichannel capabilities for wide, deep reflections. Detailed gain and filter parameters - Comprehensive controls let you decide which parts of your reverb are most present. 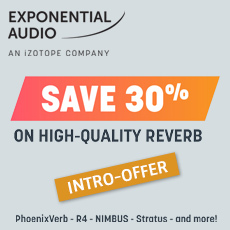 Control the tone and depth of your reverb on every level with independent EQ filters for the input, early reflections, and tail. Channel-specific delay and level controls - By specifying placement and timing of the reflections in each channel with the Balance module, Stratus helps you craft the most compelling, realistic sound environment for your audience.